The gym culture is on the rise. Being active through working out or competitive sports is more popular than ever before. This is fantastic for keeping our bodies and minds healthier. In our eagerness to maximize our time at the gym or on the pitch, stretching is often overlooked. This can be an arduous task for many of us prior to exercise. The benefits of stretching though cannot be underestimated. With adequate stretching, we can greatly improve flexibility. This can not only help reduce injury risk among athletes, but also help the rest of us stay more mobile and pain free as our years advance. As with many pursuits, it can be tough to figure out where to start and which stretches to focus on. Luckily we have answers to those very questions in this guide of simple stretches to improve flexibility. Stand perpendicular to a wall. As close as you can while still having room to rotate. Slowly rotate your arm in a full circular motion. When above your head, your arm should be parallel with the wall. Repeat 10 times in a clockwise direction before switching to 10 in a counter clockwise direction. Repeat the stretch with both arms. This is one of the easiest beginning exercises to improve flexibilityin your shoulders. As one of the most complex joints in your body, there is a high degree of injury occurrence in the shoulders, especially among golfers. Performing stretching exercises like these help keep the joint free of tension and reduce risk. Place one arm across your back with the back of your hand flat between your shoulder blades. 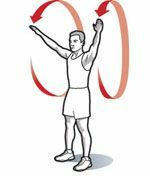 Raise your opposite arm straight into the air before bending at the elbow. Allow that hand to rest on the shoulder of that side. Reaching back while keeping a straight posture. Try to interlink or touch both sets of fingers. If you don’t have enough flexibility to interlock your hands hold onto a towel instead. If you do this consistently you’ll be able to interlock your hands. This is a challenging stretch for many which can work wonders at detecting and relieving tension of the shoulders. The beauty of both stretches is that you can perform them quickly from a standing position basically anywhere. You should immediately feel release of tension from the shoulders. Even if you cannot touch hands the first time, you will gradual improve as your flexibility increases. Assume a fully kneeling position. Bring one foot up in front of your body. You should now be in a half-kneeling position. Keep your back straight and front foot firmly planted on the floor. Lean forward into the stretch and you should feel your rear leg stretching. This is an especially helpful and easy to perform stretch for beginners. The hip flexor stretch no only helps to relieve tightness in the hip, but also the knee joint. This becomes even more important to our routine when we see that hip flexor injuries account for up to one third of acute groin injuries in athletes. Stand up with your back straight and feet together. Raise one leg behind your back at the knee. If you need help balancing hold onto to a chair or a railing. Clasp the raised leg with your hand on that side. Stretch it as far back as possible and hold this position for 30 seconds. This stretch can also be performed from a front lying position if you have difficulty maintaining your standing position on one leg. The quad stretch is highly beneficial in preventing both knee and back injuries. It is also helpful in increasing blood circulation. Improved blood flow can of course help to reduce muscle and joint pain. Assume a seated position on the floor, extending one leg out straight and tuck the other out of the way inwards towards yourself. Lean forward toward the straight foot, lead with your chest and arch the straight foot back slightly. You should feel the stretch in your hamstring muscle. Hold this position before repeating on the opposite side. Do not overstretch. Your resistance and flexibility will naturally increase over time. Hamstring injuries are among the most common in competitive sports such as soccer and basketball. This is mainly due to the sudden speed changes. The hamstring stretch is an excellent flexibility enhancer which goes a long way toward preventing injury. Especially in those who are new or returning to exercise, this will help release a lot of muscle stiffness in a key area. From a lying position on your back, raise your knees up toward your chest until your thighs are at a 90 degree angle with your angle with your torso. Rotate your raised legs to one side whilst ensuring to keep the palms of your hands touching the floor straight in front of you. Make the leg movement slowly to achieve the maximum stretch before repeating on the other side. Try to keep your shoulders and back touching the floor and as straight as possible during the stretch. It is estimated that lower back pain causes greater injury than any other condition. Maintaining flexibility in the lower back is therefore vital to an injury free life. Trunk rotations are a simple and effective stretch that even the newest of beginners to stretching can undertake. In all walks of life, whether we are professional athletes or couch surfers, flexibility is essential. The benefits of increased flexibility are ones which we will likely be able to feel long into our lives. The 6 we have outlined focus on all of the major areas where injury is most common and the key joints and muscles where we can benefit from increased flexibility the most. They are so easy and time efficient that they can be effortlessly combined with your routine. In the time it takes to boil the kettle, you could have decreased your injury risk and helped your body feel more relaxed in the process.